Chocolate is my weakness you guys! But I don't even feel bad about it. Dark chocolate is high in antioxidants and is known to be a super food. 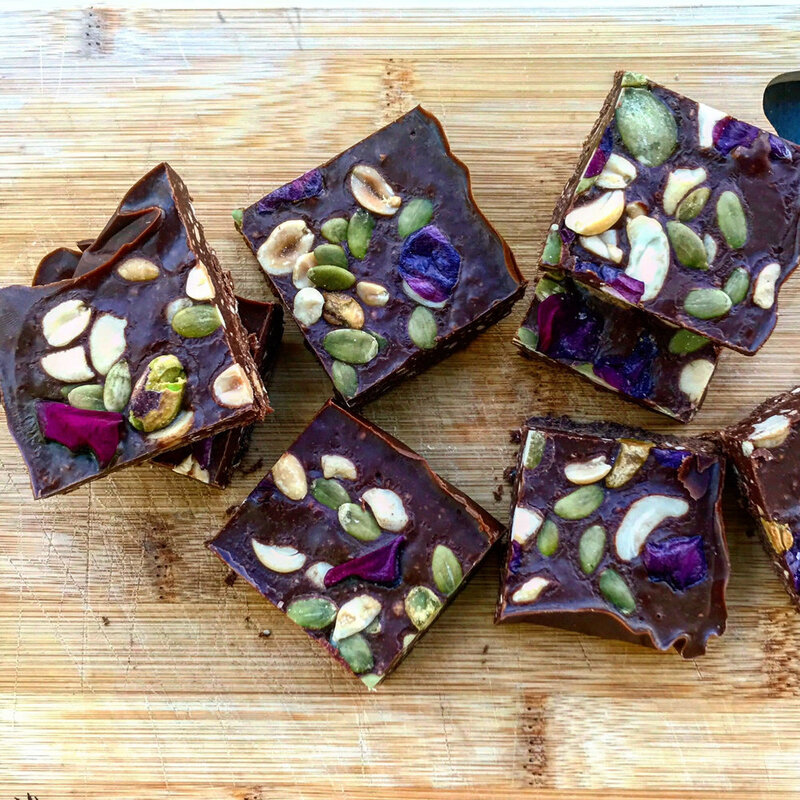 It's actually really good for you in moderate amounts...my problem is I can't restrain myself from eating a whole chocolate bar in one sitting ;) These fudge bites are super rich and are melt in your mouth GOOD! Since they are on the rich side, you don't need a lot of it to satisfy that sweet tooth, which is a good thing if your anything like me where you have one piece of chocolate and before you know it it's all gone! 1. Line a bread pan with parchment paper. 2. Heat all ingredients in a pot over medium heat just until it's all incorporated together. Make sure to stir consistently to keep from burning on the bottom of the pot. 3. Poor into the bread pan and even out. Add the mixed nuts on top, pinch of sea salt, and the petals from edible flowers if you wish to jazz it up a bit! Let sit in the freezer for about 2 hours. 4. Remove from the freezer and take it out of the bread pan. Peel off the parchment paper and cut into pieces. Keep in the refrigerator for later!